Looking ways to secure WordPress website? If you are not confident about your WordpPess website security, this post will help you understand the security threats and what can you do to reduced the chances of your site being compromised. To begin with, you should know that WordPress’s core software is itself is very secure as hundreds of developers work on it with security being their primary focus. 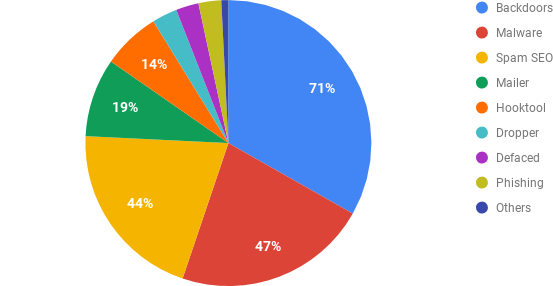 Still google blacklists 20,000 websites for malware and around 50,000 for phishing each week. Now why is that? WordPress is one of the worlds most popular content management system powering more than 32% of the world’s websites. 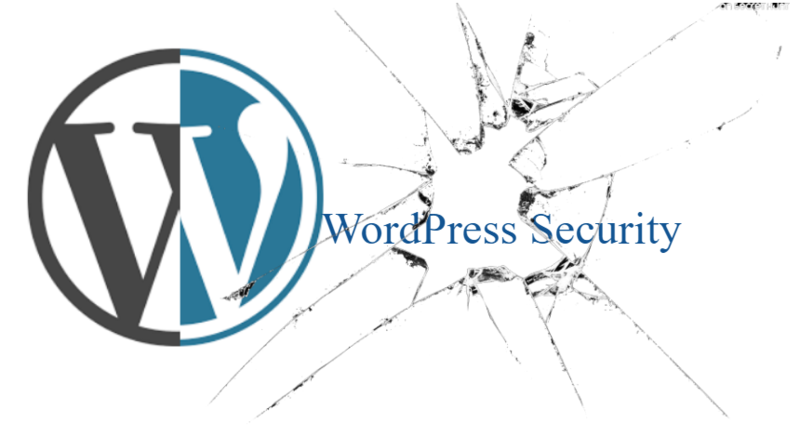 WordPress’s popularity is why it is so prone to security and malware threats. The WordPress Security team works tirelessly to prevent & neutralize any threat or vulnerability that may emerge in the WordPress Core software. They roll out regular updates fixing bugs & vulnerabilities. And even though WordPress is a inherently secure software to built your website/blog on but still there are a things that you can do to further ensure that your website remains safe and out of harms way. In this guide, you will find the best practices for WordPress security along with tips on how to improve your website’s security. If you are serious about your business then you should take care of it. Why is Your Websites Security Important? When a Website is hacked, it is blacklisted by google. This can seriously damage your reputation, harm your business in terms of revenue and scare away your traffic. You need to be careful or you might end up negotiating ransom with the hackers. Before we jump into secure WordPress, we need to understand the different types of security threats first. Backdoor: The attacker uses loophole instead of following the authentic way to access your website, without the owner finding out about this breach. Hackers leave the backdoor so that they can regain access after they have been once removed. Malware: They are malicious software purposely designed to harm your website, there is a vast variety of malware out there all differing in their potential to harm your website. Spam: These are messages that are sent to a large number of websites. They often contain links that lead to other websites (adds) or even illegal and harmful pages. Hacktools: Exploit, or DDOS tools, used to attack other sites. SSL stands for Security socket layer, Which is a very effective and useful way to secure your WordPress admin panel. A SSL certificate ensures that your website’s data is safely being transferred between browsers and web servers. This helps your website against hackers in the following way. Now search engines like Google give sites that have SSL certificates SEO ranking which leads to more traffic and business for such sites. WordPress hosting plays an important role to secure WordPress. You should choose your hosting service provider very carefully depending on your website needs. Shared WordPress hosting: In this type of hosting the server shares its resources with multiple customers at a time, like bluehost. This comes with the risk that if one of the shared websites get infected, yours might too. Managed WordPress hosting: They take care of everything on your website from websites performance to backups but most of all it keeps your website more secure. Dedicated WordPress hosting: This type of hosting is for huge websites with a lot of traffic. An individual server is given to store one website, which makes it the most secure WordPress hosting plan. Cloud WordPress hosting: This type of hosting is now becoming very popular and for good reason. There are multiple servers which work in harmony with each other and your website is not stored on one server instead it is stored on a cloud. It sets you free from the constraints of a physical server. But it gets mixed reviews about how secure cloud hosting is. If you are serious about your website and about its security, the first thing that you need to do is invest in your website hosting. It doesn’t really matter what type of hosting you choose just make sure that you choose a company that comes with a good reputation. One thing is for sure that investing in your WordPress websites hosting with a good company is something that you would not regret later. Since WordPress powers such a large chunk of websites in the world, this leaves it vulnerable to all sorts of threats. In order to keep your website out of harm’s way, you need to take as many steps as you can & installing good security plugins is one of them. You will find hundreds of security plugins in the WordPress repository. We have a list of our top 3 security plugins. Plugins like Sucuri are a blessing. They add an extra protection layer around your website, filtering all the traffic before it gets to you allowing only authentic visitors to get to you. There are other plugins that you can install to scan your website for viruses, infected files, spams, brute force attacks etc. They can prove to be incredibly helpful when your website gets attacked. See our Ultimate list of tried and tested plugins. This is another vital step you need to take seriously. Keep regular backups of your website. Now to state the obvious, backs ups are as important to your website as insurance is to your car. If you have regular backups of your website, it means that all of your data is stored safely. So in case of breach of security or hacking, in which you end up losing access to your website or lose your website entirely, you can recover all your data and start again. WordPress is a software that has a lot of world-class developers behind it. So every now and then they come up with an update, fixing bugs, improvements and even core updates that fill out security patches. In other words updates are good for you and your website. You should keep your website regularly updated. Luckily, updates can be done automatically and if not, you can manually do them in just a couple of clicks. Keeping your WordPress core up-to-date would apply all the new security patches that have been released to your website. We are not sure why but users are generally not very found of updates. Hackers use this to their advantage, they exploit it to their benefit by using already solved bugs to hack websites that have not yet been updated. Only about 40% of the WordPress websites are up to date which puts them all at risk of being hacked. The best and the easiest thing that you can do is to regularly update your website’s theme and plugins. WordPress automatically roles out updates for its users. But we would suggest that you keep an eye on it as risk reduction, you never know when things may go wrong. Whenever there is an update in the core software of WordPress it appears like this. And as for the plugins you can change the default setting to update automatically instead of keeping it manually. If you have a huge website or are using if for business we would suggest that you look into hiring WordPress maintenance services. WordPress themes and plugins can be edited easily from your WordPress admin area which is a really cool feature until your website falls into the wrong hands and they are able to do the same. They can mess with your file by changing them or injecting your files with malicious code or links. According to a report by Panda Security 81% of attacks are based on insecure or stolen passwords. getting hold of someones password is the easiest way to hack a website. Once a hacker gets hold of your password, all they have to do is login and change it. And there your website has been hacked! To avoid this here is a list of does and don’t you should consider while deciding upon a password. Install this plugin, limit login attempts reloaded. This will protect you from brute force attack. Brute force attack is when a hacker opens your login page and starts trying out different passwords with different combinations. According to a report 8% of the websites are hacked because of weak passwords. The problem with the generally used single factor (password) authentication is the single step, the passwords, that can easily get leaked, stolen & even guessed. And once your password is gone consider your entire website gone. You can add your bio-metric (something that you are) details like you thumbprint & face recognition (like iPhones). In this case, even if someone has your password they won’t be able to log into your website without you personally being there. Another thing that you can do like Gmail and Facebook is to use something that you have. Like your mobile phone on which you get a code or your email address on which you receive a erification Email. The third could be something that you know, like a question. That only you know the answer too. The WordPress Team once said that weakest link to your WordPress security is your Password. Two-factor authentication can help you prevent situation, where your password is stolen and you end up losing access to your website. Normally people don’t change this. But we would suggest that you change this prefix to something else due to the following security reasons. Firstly if you have a different database prefix it would protect you from these obnoxious SQL injections and later from brute force attack. Hackers generally follow the standard queries when they attack a website. Now if your database details are different they will face an error. Otherwise, it becomes one less piece of information they need to hack your website. You can simply change it to your name or anything that you feel like but not to predictable. Be creative its for your own security! Often hackers try their luck out by brute force attacks, they open your login page and try out random usernames and passwords. The default username that you get is ‘Admin’. You can change it to your name or your email address or something that is less obvious. Which we would suggest you do. So the first thing they need is to guess the right username. And if you haven’t changed your username from the default one, it becomes one less thing that they need in order to succeed at hacking your website. There are basically three ways to change your username, however we will only discuss one in this guide. The manual method of changing your user name. 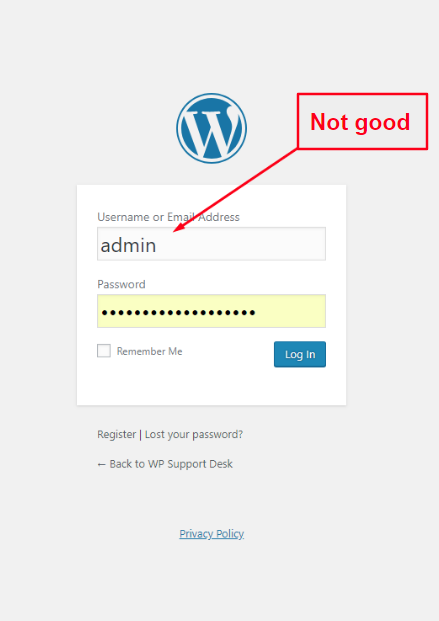 You have no direct option in WordPress to change your username but there is a way around it. You need to open USERS from your dashboard navigation menu. Fill in the required information. You are going to have to add a different email address for this new user. (you can change it back to the original one once this process is complete). It goes without saying but make sure that you add a strong password. And give this user administrative role. 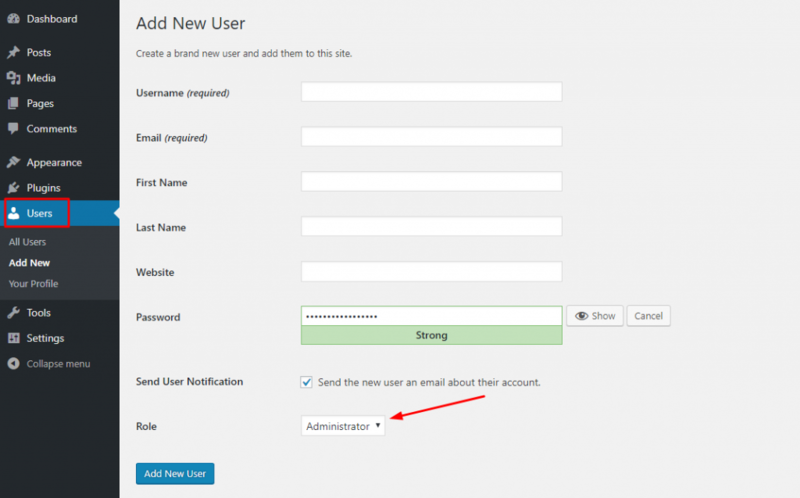 Once you have completed this process you can change the email address of the new user to the one that you used in the other account. Changing the user name alone does not mean that you are completely out of harm’s way. But its a small strategic action in your battle against hackers. It’s better to take the fate of your website in your own hands rather than leaving at the mercy of hackers and luck. 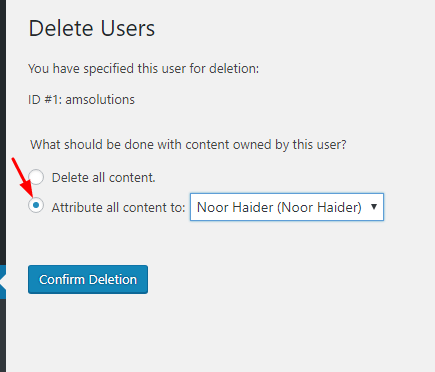 Once you click on delete user you will see this page, transfer all the data from this account to the new one you made by checking the box that says ‘attribute all the content to the new user’ that you made. WordPress’s software leaves a footprint of its version on your site, which tells the outside world information about the version of WordPress being used on your website. Now for normal traffic, it would mean nothing. but for prying eyes, this is valuable information that they can use and exploit in order to hack your website. There are certain bugs that have already been taken care of in the update but you are still facing them since you haven’t updated yet. And this is exactly the lope hole that hackers are looking for. They will manipulate this bug to damage your website. This is one of our risk reduction strategies as this is not solely strong enough for the elimination of threats. You just need to add this one code by developer Frankie Jarrett in your functions.php file and all the WordPress version on your website will be hidden from public eye. The importance of WordPress Security for you website. The inevitability of a security breach happening one way or an other. Keeping in view these two facts our advice would be that you should keep regular backups of your website as well as the data base as a top priority. Applying Murphy’s law, worst case scenario a hacker gets into your website, at least you’ll have a clean copy of your website to reinstall. It is also a good idea to contact your website hosting provider who will help in making your website more secure. We are a team of WordPress consultants, developers & customer happiness support members who are consulting, developing, maintaining and providing WordPress support since 2010.